THIS YEAR, the vaunted quinquennial Documenta 14 will take place in two cities, opening in Athens on April 8 and in Kassel on June 10. Artistic director Adam Szymczykwho is collaborating with an extensive team that includes curators Pierre Bal-Blanc, Hendrik Folkerts, Candice Hopkins, Bonaventure Soh Bejeng Ndikung, Hila Peleg, Dieter Roelstraete, and Monika Szewczyksat down with Artforum editor Michelle Kuo to discuss the broad range of sites, forms, and ideas at play, from the democratic ideals of classical antiquity to the crisis of contemporary austerity. Cranes lift Marta Minujín’s Partenón de libros prohibidos (Parthenon of Banned Books), 1983, Avenida 9 de Julio, Buenos Aires, December 24, 1983. MICHELLE KUO: Athens was at the epicenter of global financial and political turmoil when you began organizing Documenta 14, and of course many additional upheavals have occurred since thenthe refugee crisis and the entire crisis of Europe. How has your thinking about the exhibition evolved as these events have unfolded? ADAM SZYMCZYK: In the fall of 2013, I proposed to the Documenta 14 search committee to hold the exhibition in Athens as well as in Kassel. At that time, Greece’s problems were frequently front-page news in Germany. The German press and politicians were keen on offering advice, in an admonishing toneand they soon began to instruct this relatively poor southern European country to institute capital controls, to levy more and more taxes on people who have little if any income. The implicit or explicit theme was that Greece is a backward country, not up to European standards. That attitude was ironic, to say the least, considering that classical Greece, so widely held to be the cradle of civilization, was a touchstone in the formation of German national consciousness. The early Romantics claimed classical Greece as the origin point in a progression leading straight to them. As it happens, Kassel was also the home of two of the major protagonists in the German Romantic nationalist project, Jacob and Wilhelm Grimm. Their collecting of German fairy tales and efforts to create a complete German dictionary provided elements of both a mythical and a linguistic foundation for the construction of German identity. MK: So the cultural and political imaginary of Germany takes shape in and around Kassel. AS: Yes, at least to a degree. In terms of more recent events in Greece, the introduction of austerity measures was justified by Protestant moralism and a strange logic whereby the populace, the people, were blamed for their circumstances. And when you make the people as a whole culpable, you instill a sense of guilt and a sense of inferiority that produces a lot of frustration and self-hate. AS: And resentment, and I think ultimately xenophobiaas demonstrated in Greece by Golden Dawn, a local neofascist party that made significant gains in parliament between 2009 and 2012 as economic turmoil increased. One of the reasons to work in Athens in parallel to Kassel is precisely to make the exhibition in a place where you can see how problematic things are at the moment, and how much worse they may soon becomethough not, naturally, to simply induce passive spectatorship. Our rubric “Learning from Athens” emphasizes an idea of active exchangenot an extraction but rather a distribution of knowledge that propagates outward, reconfiguring the relationship between those who speak and those who are spoken about. That notion of reciprocity also meant rejecting a geographic construct of Kassel as home base and Athens as peripheral or as an outpost. Instead, we envisioned the exhibition as a kind of divided cell, with most artists working in both places. So, from the beginning, we committed to this open-ended, ongoing process that would ideally produce knowledge about conditions within and far beyond Athens, conditions that are themselves constantly evolving. MK: Your concept of the exhibition was accompanied by the idea of a Parliament of Bodies, foregrounding the political valences of this paradigm. AS: I invited Paul B. Preciado, a philosopher and activist, to create a concept for public programs instituted in advance and as a fundamental part of the exhibition, not as its discursive, descriptive aside. The result was the Parliament of Bodies, which was inaugurated in September 2016 with “34 Exercises of Freedom,” and which explored a variety of languages of resistance in talks, art events, workshops, and so on. It took place at the Athens Municipality Arts Center in Parko Eleftherias [Freedom Park], next to a building that was a place of detention and torture during the military junta in Greece from 1967 to 1974, and that is now home to the Museum of Anti-dictatorial and Democratic Resistance, organized and run voluntarily by those persecuted during the junta. MK: The Societies, as you call them, seem especially germane herecould you say a little about how they fit into the scheme of things? AS: The Open Form Societies, which also fall under the overall Parliament rubric, are a growing constellation of self-organizing groups, each of which was convened to address or explore a particular discourse or problem or proposition. For instance, the Society for the End of Necropolitics investigates contemporary necropower and possible modes of resistance to it. Since late 2016, the Societies have been meeting once a month for discussions, screenings, whatever methodology or form of action the members choose to pursue. The choice to call them Societies invokes the precedent of late-eighteenth-century Societies of Friends, antislavery and anticolonial organizations that arose both to create and share knowledge and to function as platforms for political action. Such groups, influenced by ideals of the French Revolution, were also active in Greece in the early nineteenth century, preceding its formation as an independent nation-state. That said, all our activities during the run-up to Documenta 14 have been essential for what the exhibition is to become. These include the weekly broadcast Keimena [Texts] on Greek national television, conceived by curator Hila Peleg and cocurated by Vassily Bourikas, which focuses on experimental documentary and fiction films. We saw some statistics for it recently. It seems that more than half of the people who are watching are outside Athens and Thessaloniki, in smaller towns, in villages. The program is reaching an audience that is usually counted out, and it does produce reactions; people talk about it. And hopefully it will keep doing that beyond the end of the exhibitionit will continue for another two months after Documenta formally ends in Athens in mid-July. We are also producing an experimental-music concert series, the radio project Every Time A Ear di Soun, initiated by Bonaventure Soh Bejeng Ndikung, curator at large of Documenta 14, who is commissioning sound works and working on archival sound material with ten international radio stations. And we’re temporarily acting as publishers of the magazine South as a State of Mind, founded in Athens by curator Marina Fokidis and edited for four issues by Quinn Latimer and me, the last of which appears this summer. The exhibition can really only be seen as coextensive with these formatsin opposition to a more conventional exhibition setup, where the events, seminars, and so forth are considered ancillary. MK: In terms of the more practical aspects of this engagement with the city, how have you approached the integration of the exhibition into preexisting institutional structures and spaces? AS: We were primarily interested in working with those institutions in Greece that are fully or partly publicly fundedthe School of Fine Arts, the Athens Conservatory, the National Museum of Contemporary Art, and a whole range of smaller entities, including informal onesto insist on their essential importance to the communities of which they’re a part and to society at large. A structure of production and consumption of culture financed entirely through private donors cannot replace the public dimension. The hope is that Documenta will raise awareness of the importance not only of contemporary art but of cultural production in general, in the social and political sphere, and will make these issues the subject of public debate. Maybe this could become one model for resistance to the predictable neoliberal patternto which, at the moment, Greece is subject, despite being governed by the nominally left-wing SYRIZA party. There’s a deep crisis, and under the current austerity plan, it is scheduled to continue for many years. There’s a lack of any sign of serious recovery. To the contrary, the country’s current trajectory means that it will sink more and more under the weight of austerity. MK: One wonders when the breaking point will be reached in these conditions. AS: I think the breaking point has already been reached many times. A lot of people in Greece seem resigned and obviously exhausted, living on less than modest wages or unemployed. There is anger but no way of channeling it. Which means that it may turn into rage one day. MK: It’s almost like a period of mourning that follows destruction. AS: Yes, though one could say that mourning, or at least melancholy related to a profound feeling of loss, has always been part of the modern Greek nation’s self-conception. To a non-Greek person like me, the state appears to be founded on the idea of overcoming the oppression of Greece during Ottoman rule and going back to classical origins, but always lurking in the background is this idea that the Greeks of today are not worthy heirs to the classical heritage on which their society was literally built. The other day I was talking to someone about their first visit to Athens, and they said, “What amazed me most was the way the ruins of the Parthenon are actually right in the middle of this huge city, that they’re not on the outskirtsthe city’s built around this ruin and this rock.” It’s a massive fragment, a completely broken thing that constitutes a sort of symbolic beginning, on the rock of the Acropolis, around which the city sprawls. MK: That resonates with one of the statements in the exhibition materials, in which democracy is characterized as a project that is unfinishedyet already lies in ruins. And you position the Parliament of Bodies as a queering of this fragmented or broken political tradition. At the same time, it’s a pointed challenge to Bruno Latour’s notion of a Parliament of Things. And that in turn raises the question of the relationship between your exhibition and the conceptual framework of the previous Documenta, which advanced certain ideas about materiality and objecthoodfor example, the curator explicitly drew on Latour as well as on thing theory, and on ideas about leveling objects and subjects. Did that backdrop inform your thinking about this Documenta? AS: I think we are more interested in the body immersed in history and politics, the individual body and the kind of subjectivity that is bound to this particular body in specific contextswhere the body can become a sign while retaining agency; it can actually instantiate something of the experience of history and of political rupture. MK: This connects to the interest in necropoliticshow Foucault’s theorization of biopower has been inflected and changed by critiques that foreground other kinds of subjectivities, other kinds of histories, and other kinds of discipline and control, in a global context rather than a Western European one. That seems really relevant to how you’re thinking about bodiesespecially since, as you’ve pointed out, we are witnessing the largest global movement of bodies, the largest mass migration that the world has seen, since World War II. AS: Yes, that is true. People bring very little with them, so they mostly bring their bodies, and these bodies add up to a problem that is dealt with through the power of nation-states, which means more borders and more repression against these “illegitimate” bodies. This nexus of the nation-state and neoliberalism is what interests us, particularly how these two things that are seemingly opposed to each other actually work in sync. On the one hand, you have the essentializing power of the nation-state, which works to instill in its citizens a belief in their sovereignty and uniqueness, and on the other hand you have the flattening alloverness of neoliberal economics and its attendant predatory politics. And yet these two forces somehow seamlessly work together, leaving little leeway for bodies to be freer or to escape the objectification that is part of the intersection of the political and the economic. The perfect distribution of this power, which is not located in any single agent or institution, makes it extremely difficult to address and formally demand changes of it. There’s a growing feeling that somehow electoral democracy is not sufficient, that elected representatives are not representing the people. This should not be taken as an argument justifying authoritarianism, but it does locate the beginning of authoritarianism, as I understand it, in the unfinished and currently failing democratic project. MK: Rightas Giorgio Agamben says, it’s not just about the fact that there are apparatuses of power, but that there is now a proliferation, a mind-blowing proliferation of those apparatuses, and so it becomes hard to even conceive of or address, let alone act against, these distributed forms of power. But I wonder how you see the exhibition’s artists engaging these questions, whether through form or action or the body? AS: We are working with artists who are acutely aware of and concerned about our situation today, so their work is a response to these conditions, though it doesn’t always necessarily take the form of an overt political statement. A work is an extension of the conditions of life, not their illustration. MK: In the category of projects with a more clearly political stance, I understand that Marta Minujín, who is so fantastic, will be constructing a Parthenon of Books in Kassel. AS: There will be a reconstruction of the Parthenon made entirely from donated books, all of which have been banned somewhere at some pointwhich is probably true for all books! 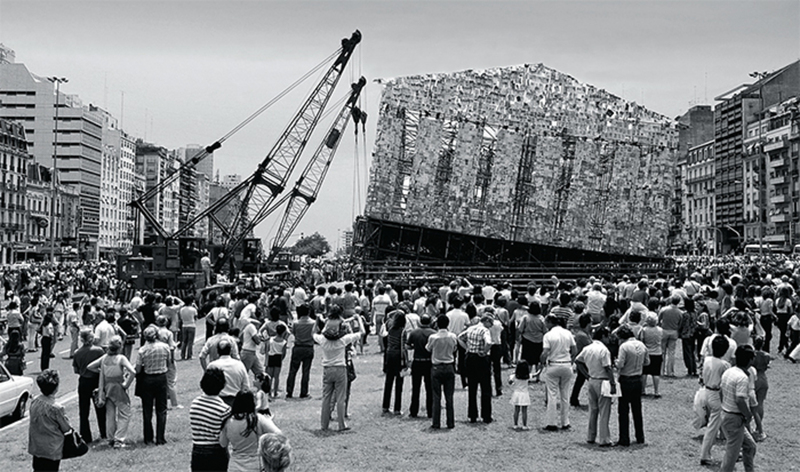 The Parthenon stands for the idea of democracy, and Minujín’s version of it, first realized in Argentina in 1983 after the junta fell, begins to speak through this multitude of books. They are going to form a sort of skin over a steel-tube construction. It’s one-to-one scale, so it will require many thousands of volumes. But there is certainly no shortage of banned books. We’ve listed more than seventy thousand on the Documenta 14 website, for prospective donors to consult. Whole categories of booksliterature, scientific treatisescensored, forbidden, or destroyed. The list is a record of the systemic hate that many regimes of power, throughout history and around the world, have harbored toward books, their readers, and their authors. MK: It’s interesting, too, how the project speaks to the persistence of old-fashioned tactics of suppressing information and spreading misinformation. In the US, for example, it’s like they’re bringing back the old playbook from the 1950s and ’60s. AS: We were also surprised in Poland, where I come from, that these tactics still work. Of course, there’s always resistance, but we are currently living through a period where the whole apparatus of state violence is more intact than ever and ready to intervene. So even if you resist, you might be contained easily. There are quite a lot of street protests and there is a prodemocratic movement and so forth. But it hasn’t brought about any change at allthe government is still pursuing its authoritarian course, looking to Hungary as its template, and now they have Trump as an additional role model. MK: And this question of how resistance is contained often does have to do with forms of bodily movement, like protests. Which of course we’ve been thinking about a lot in the US, but there’s also a sense that we need to think about other tactics of resistance that are more commensurate with how power actually works today. For example, it’s obvious that information leaks and hacking have had far more effect on recent world events than have traditional protests. AS: Yes, the resistance is contained as long as it is fully transparent. People hold placards on which they write statements, which are fantastic, but there is no coordinated strategy and no clear idea how to turn from the expression of critique to politically efficient action and how to organize practicewhile the adversary has a strategy and adjusts it constantly. MK: And so we come back to the role of culture itself. This is precisely a question not only of commenting on but of counteracting. What are the capabilities of culture? I’m curious about what kinds of historical models you have looked to. AS: Anything from realism to avant-garde and neo-avant-garde modes of resistance or dissent to indigenous methodologies and queer guerrillas. There’s a great diversity of potential models. Art is an area of human activity that is naturally geared toward expressing a kind of disjunctionit’s one of the few areas left that is not fully mapped, territorialized, and colonized. It offers space for enacting the right to disagree, formulating counterproposals, and so forth. It’s quite telling, too, that social movements often use strategies of communication and critique originally devised by artists. MK: Absolutely. And I think one of the most ironic or shocking developments we’ve witnessed in the past two decades is the way that some of these strategies have been so handily appropriated by the Right. For example, the jettisoning of master narratives and the critique of empiricism have now been globalized and deployed in all these reactionary ways. The denial of climate change is an obvious case in point. But we face a real dilemma, because even though we need to resist the resurgence of “alternative facts,” we can’t go back to a naive conception of truth and objectivity. AS: Yes, that kind of newspeak is completely mainstream now. But it’s far from unprecedented. Totalizing political attitudes always produce these kinds of languages. MK: Realism is interesting in this regard, because it’s always had to grapple with questions of what constitutes the real and how or whether it can be represented, and yet it’s always seen as not being sufficiently critical enough. AS: I think of realism as dealing with facts of biological and individual existence, with people who are suffering here and now from some kind of trauma or oppression, physical, psychological, or otherwise. We intuitively sense what is real in how we are affected and hurt by and left vulnerable to what surrounds us. In the ideal case, an artist could help to expose some of these mechanisms, some of the ways in which the production of pain and fear is used to organize and manage people, whether we’re talking about managing the so-called “flows of migrants” arriving in Greece or managing the disturbing truth of mass incarceration and torture in Syria. Take, for example, Artur Żmijewski filming the now-burned “Jungle” refugee camp in Calais, or Ahlam Shibli photographing the results of Israeli land politics and Palestinian counterpolitics of memory.I guess when I speak about realism, I mean the degree to which these mechanisms can be decoded, exposed, and eventually disarmedbecause I do believe, with Lee Lozano, that the revolution must be both personal and public, and won’t be achieved via rationality but rather through affective engagement. And this comes back to the idea of a Parliament of Bodies as opposed to a Parliament of Things. We were told for so many years that physical presence was no longer important in politics, that the body had been fully subsumed by social media. But suddenly, it has become important to put your body forward. Artists can again say something important here, because, whatever form their work may take, they constantly negotiate the duality of the concept and the physical action or act. Maybe in this way, the objecthood of art is also of some importance, because at least the made object has a kind of stubborn residual presence, one that must be interpreted so that the object can be put to some use. The degree to which it works can be measured by the kind of debate it produces, which doesn’t require a blunt political statement. The object can be enigmatic. MK: It’s precisely not transparent. AS: Exactly, it’s not transparentin contrast to our societies, which are organized around a demand for full transparency that equals full scrutiny. The object cannot be reduced to some simple statement, or even a complex one, for that matter. It’s impossible to translate it accurately, or rather, it’s possible to translate it in fifteen ways, which is great. We can read poetry written in languages we don’t speak. Language can be as irreducibly enigmatic as the object, which is why we’ve included so many literary texts in South as a State of Mind, and in the Reader published to coincide with the exhibition. I would like Documenta 14 to be as much about text and spoken word as images, still or moving, or objects. The conventionally subservient position of text to object is something we’d like to destabilize, or at least begin destabilizing. MK: Are there specific projects that enact that kind of destabilization? AS: Peter Friedl, for instance, is presenting a video in which fragments of Franz Kafka’s “Report to an Academy” are spoken to the camera by a number of professional and nonprofessional actors. These actors seem to be people with different class and national backgrounds, so the text acts as a kind of common denominator, or foil, that makes these differences more visible, and so watching the film becomes an exercise in catching yourself categorizing these people according to the way they look, their accents, their mannerisms. You perceive yourself becoming almost a kind of machine that sorts them. You become aware that you have an automatic way of judging conditioned by your education, class, ethnicity, and so onone that’s difficult to shed. You, the viewer, are the subject of the film no less than the actors and the role they were given to interpret. We’ll also be showing Susan Hiller’s Last Silent Movie [2007–2008] and its companion piece, Lost and Found . Both are about languages that are extinct or nearly extinct and efforts to recover or preserve them. For many native speakers, or descendants of native speakers, it’s extremely important to reclaim these languages, as a source of empowerment and also of distinction.They’re almost like secret languages, against the normalizing power of official ones. MK: So there’s a politics of legibility or decipherability in play here, tooa question of who has access to language, or to culture in general. AS: This is something we were very concerned with, and we’ve tried to make the work in the exhibition accessiblenot through explaining it, but by putting the artists in contact or into encounters with different groups, different audiences on different occasions, and having workshops or conversations or open rehearsals. For instance, last year we initiated Continuumopen-ended semipublic sessions with artists and curators at the Athens School of Fine Arts. Continuum in this sense refers to a term used by Greek composer Jani Christou [1926–1970], who moved gradually from experimental musical forms to open scores, enabling all kinds of activitiessound and performance being only two possibilitiesto take place over a duration whose length was determined by participants. The show has many other such capillaries. One of them is “aneducation,” conceived by Sepake Angiama, Clare Butcher, and Arnisa Zeqobringing people into unusual formats for conversation, well before the show has begun. It’s inspired by the counter- and alter-pedagogical experiments of Lucius and Annemarie Burckhardt, Oskar and Zofia Hansen, Fernand Deligny, and the like, and draws on the experience of art schools such as Santiniketan, founded by Rabindranath Tagore in India, and collective social experiments such as Ciudad Abierta in Chile. MK: You’re spanning disparate pedagogies but also histories. AS: Along with our initial desire to unsettle the exhibition geographically and to move it far south of Kassel, we also wanted to transform its temporality.We felt it was important that Documenta 14 not be limited to these hundred days when the spectacle of the exhibition is supposedly taking place. We wanted to deflate this expectation that it would open and then end and disappearto have a before and to have an after, too. An ongoing celebration. Documenta 14 will take place Apr. 8–July 16 in Athens and June 10–Sept. 17 in Kassel. To read Documenta 13 artistic director Carolyn Christov-Bakargiev in conversation with Elizabeth Schambelan in the May 2012 issue of Artforum, click here. 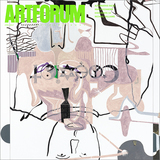 Daniel Birnbaum's review of Documenta 13 in the October 2012 issue of Artforum is available here.